To gain more insight into the molecular mechanisms of chondrogenic differentiation induced by transforming growth factor (TGF)-β1 and insulin-like growth factor (IGF)-I and insulin, we performed cDNA microarray experiments during the chondrogenic differentiation of human mesenchymal stem cells (hMSCs), which provide an excellent in vitro model system for chondrogenesis. Our repeated cDNA microarray analyses identified the up regulation of 23 transcripts and the down regulation of 25 transcripts after 14 days of chondrogenic induction. We found that many of the up regulated and down regulated genes belonged to overlapping gene categories; specifically, 44 and 40% of the up regulated and down regulated genes were associated with the extracellular matrix and metabolic pathways, respectively. The expression of the identified genes was confirmed by RT-PCR. These analyses suggest that the transcriptional control induced by TGF-β1, IGF-I and insulin signaling during the chondrogenic differentiation of hMSCs is mainly targeted to genes belonging to specialized gene categories. Cartilage is essential for skeletal growth and the functional integrity of the skeleton. Cartilage formation is driven by the commitment of undifferentiated mesenchymal precursor cells to the chondrogenic lineage, which triggers chondroprogenitors to form cellular condensations and to differentiate into chondroblasts (Shum and Nuckolls, 2002). Mesenchymal chondroprogenitor cells first proliferate and then differentiate by increasing the cell volume and producing a large amount of cartilage-characteristic extracellular matrix proteins, like type II collagen and aggrecan, that link protein and cartilage oligomeric proteins (Tuckermann et al., 2000). The cells then become hypertrophic and start to synthesize type X collagen. The majority of the differentiated chondrocytes appear to undergo apoptosis and are replaced mainly by bone marrow and blood vessels accompanying osteoblasts and osteoclasts that ultimately produce bony tissues. Cartilage cannot repair itself and cartilage degeneration, such as that which occurs in osteoarthritis, leads to serious disability. Previous results have indicated a role for β-catenin and Wnt signaling in chondrogenesis (Day et al., 2005). Moreover, the proliferation and differentiation of chondrocytes is cooperatively regulated by key secreted proteins that include bone morphogenetic proteins (BMPs) 2, 4 and 7-members of the TGF-β superfamily-as well as Fibroblast Growth Factors (FGFs) and Insulin-like Growth Factors (IGFs) (Kronenberg, 2003). Recent comprehensive gene expression analyses have successfully identified the downstream targets of these ligands (Dailey et al., 2003). In addition, the sequential differentiation and maturation of chondrocytes from Mesenchymal Stem Cells (MSCs) to hypertrophic chondrocytes in endochondral bone formation is regulated by several transcription factors including Sry-type high mobility group box (SOX) 5, 6 and 9 and core binding factor α1 (CBFA1), also known as runt-related gene 2 (RUNX2) family members (Komori et al., 1997; Otto et al., 1997; Akiyama et al., 2002). SOX9 plays an essential role in establishing the condensation of prechondrogenic mesenchymal cells and initiating chondrocyte differentiation (Akiyama et al., 2002). The expression of the α1 chain of type II collagen (COL2A1), a major component of the cartilage extracellular matrix, is regulated by SOX9 (Bell et al., 1997). Molecular signaling during chondrogenesis has been studied using expression profiling and microarray technology. Such studies were performed using the mouse embryonal carcinoma cell line ATDC5, immortalized human chondrocyte cell lines like C-28/I2, chondrosarcoma-derived cell lines and murine micromass cultures. BMPs or FGFs were used to enhance cartilage formation in MSCs (Sekiya et al., 2005; Solchaga et al., 2005). IGFs have been shown to play a central role in chondrogenesis, as indicated by the severe growth failure observed in animals carrying null mutations of Igfs and Igf-I receptor genes. Indeed, IGF-I showed potent chondrogenic effects in MSCs, similar to the effects of TGF-β1 (Longobardi et al., 2006). Insulin alone stimulates ATDC5 cells to undergo chondrogenic differentiation (Shukunami et al., 1996). Understanding the molecular events through which TGF-β1, IGF-I and insulin cooperatively determine the chondrogenic potential of hMSCs is important for the therapeutic use of these factors in the treatment of cartilage disorders. To improve our understanding of the global molecular basis of cellular signaling in chondrogenic differentiation, we searched for genes that were up regulated or down regulated after TGF-β1-dependent, IGF-I-dependent and insulin-dependent chondrogenic differentiation in hMSCs, which were initially isolated from bone marrow and characterized by the expression of various cell surface markers. MSCs are progenitor cells that have the potential to differentiate into several mesenchymal tissue lineages, including cartilage, bone, muscle and fat and thus represent a potential source of pluripotent cells for autologous bone tissue engineering. The results from our transcriptome analysis suggest that at the onset of chondrogenesis, a number of genes involved in the extracellular matrix and metabolic pathways are induced by the combination of TGF-β1, IGF-I and insulin in hMSCs. Cell cultures: hMSCs were purchased from Cambrex (New Jersey). The cells were maintained in Dulbecco s Modified Eagle s Medium (DMEM) containing 10% Fetal Bovine Serum (FBS) and antibiotic/antimycotic solution (100 units mL -1 penicillin, 100 μg mL -1 streptomycin and 250 ng mL -1 amphotericin B). The chondrogenic differentiation of hMSCs was induced by adding Chondrocyte Differentiation Medium (CDM) SingleQuots Kit CC-4408 (Cambrex, New Jersey) -including TGF-β1, IGF-I analog, long R3 IGF-I (R3-IGF-I), insulin, transferrin and gentamicin/amphotericin B-to DMEM containing 5% FBS, 100 μM ascorbic acid-2-phosphate, 1 mM sodium pyruvate and 350 μM proline. 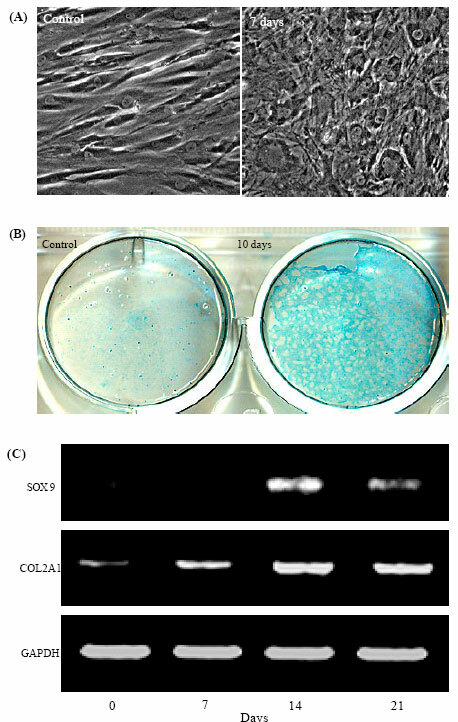 Cells were stained to reveal chondrogenic differentiation using Alcian blue (Wako Pure Chemical, Osaka), which binds sulfated proteoglycans. Briefly, the cells were washed twice with phosphate-buffered saline and fixed for 2 h in a 10% formalin solution. Alcian blue (pH 2.5) was added to the cells and the samples were incubated at room temperature for 2 h. Excess stain was removed and the cells were rinsed twice with 70% ethanol to remove residues before visualization. RT-PCR method: Total cellular RNA was extracted using TRIzol reagent according to the manufacturer s instructions (Invitrogen). RT-PCR was performed using the SuperScript one-step RT-PCR system and gene-specific primers according to the conditions recommended by the manufacturer (Invitrogen). Reaction mixtures containing total RNA (500 ng of each), 0.2 mM dNTPs, 0.8 μM each primer, 2 units of enzyme mixture including SuperScript II RT, platinum Taq DNA polymerase and 1x buffer with 1.2 mM MgSO4 were kept at 50 °C for 30 min and then at 94 °C for 2 min; PCR was then performed. The PCR profile was 22-27 cycles at 94 °C for 15 sec, 55 °C for 30 sec and 70 °C for 1 min. The RT-PCR primers were designed based on human sequences in GenBank. These sequences are listed in Table 1.
cDNA microarray: Total RNA was verified using an RNA 6000 Nano assay and an Agilent Bioanalyzer (Agilent Technologies). Ten micrograms of total RNA was reverse transcribed into cDNA using cyanine 3-dCTP (Cy3) or cyanine 5-dCTP (Cy5) (PerkinElmer). Labeled probes were hybridized using an Agilent human 1 cDNA microarray kit (Agilent Technologies), which included 12,814 unique clones from Incyte UniGene 1 and human drug target clone sets. The microarray was scanned on both Cy3 and Cy5 channels using an Agilent DNA microarray scanner (Agilent Technologies). The raw data from the microarray assay were normalized according to the manufacturer s guidelines using Feature Extraction software from Agilent Technologies. A ratio of normalized intensity >2.5 or <0.4 was used to generate a list of genes with significant changes in expression during chondrogenic differentiation. The expression profile data were evaluated using duplicate experiments. Chondrogenic differentiation of hMSCs: When TGF-β1, IGF-I and insulin were added to the culture medium, the cells rapidly lost their fibroblastic morphology. As shown in Fig. 1A, hMSCs showed a dramatic alteration in cell morphology after 7 days of treatment in chondrogenic differentiation medium. This alteration was accompanied by the rapid biosynthesis of glycosaminoglycan and shown by Alcian blue staining (Fig. 1B). Chondrogenic differentiation occurs when MSCs are grown under conditions that include a three-dimensional culture, a serum-free medium and the addition of a member of the TGF-β superfamily (Heng et al., 2004). To induce chondrogenic differentiation in hMSCs, different factors such as FGFs and BMPs have been used (Sekiya et al., 2005; Solchaga et al., 2005). In particular, addition of IGF-I and BMP2 to hMSC has been shown to induce markers of osteogenesis (Koch et al., 2005). IGF-I chondroinductive actions were equally potent to those induced by TGF-β1 and the two growth factors had additive effects (Longobardi et al., 2006). Besides TGF-β1 and IGF-I, insulin was added to chondrogenic differentiation medium. By microarray analysis, IGF-I and insulin were shown to induce different patterns of gene expression in mouse fibroblast NIH-3T3 cells. Interestingly, more than half of the genes up regulated by IGF-I are associated with mitogenesis and differentiation, whereas none of the genes specifically up regulated by insulin are associated with these processes (Dupont et al., 2001). On the other hand, the set of genes revealed to be differentially regulated in another system did not overlap at all (Mulligan et al., 2002). It is still not understood how the specificity of IGF-I versus insulin signaling is controlled in chondrogenesis. The divergent effects of IGF-I and insulin may be explained by specificity in the intracellular signals generated by IGF-I and insulin. We chose to study the additive action of IGF-I and insulin on an accepted model of chondrocyte differentiation. Transferrin, which is known as a major angiogenic molecule produced by hypertrophic chondrocytes during endochondral bone formation, was also included in the chondrocyte differentiation medium. In the presence of TGF-β signaling during chondrogenic differentiation, MSCs synthesize aggrecan, link protein, fibromodulin, cartilage oligomeric matrix protein, decorin, type II collagen and chondroadherin, all components of the normal articular cartilage matrix (Barry et al., 2001). We checked the expression of well-known cartilage-specific genes. An expression analysis for the known chondrogenic markers SOX9 and COL2A1 using semi-quantitative RT-PCR in differentiated hMSCs was completed prior to the microarray analysis to validate the RNA quality and to verify the chondrogenic differentiation in these trials. In this manner, we showed that SOX9 and COL2A1 were induced during the course of hMSC differentiation into a chondrogenic lineage (Fig. 1C). The gene expression of SOX9 increased until it plateaud on day 14 of the culture period. Microarray analyses: To determine the molecular events during the chondrogenic differentiation of hMSCs, especially those induced by TGF-β1, IGF-I and insulin, we employed cDNA microarray technology. We identified 23 genes that were up regulated and 25 genes that were down regulated after 14 days of treatment in chondrogenic differentiation medium. The experiments were performed at least twice and the mean and Standard Deviation (SD) values were determined for each gene. Under our assay conditions, a more than 2.5-fold or less than 0.4-fold difference was considered to indicate a candidate novel marker of chondrogenic differentiation (Table 2 and 3). We classified the 48 genes according to their functions as follows: extracellular matrix, metabolism, protein modification, transcription, cell growth, cytoskeleton, ion transport and unknown (Table 2 and 3). The frequencies of these functionally classified genes are shown in Fig. 2A and B. Remarkably, the categories to which the up regulated and down regulated genes belonged overlapped. We found that genes involved in the extracellular matrix and metabolic pathways significantly accounted for 44 and 40%, respectively, of the up regulated and down regulated genes. Cartilage matrix proteins have important roles in the maintenance and organization of chondrocyte phenotypes. The presence of cartilage-specific matrix proteins in the cell signify the developmental stages of chondrogenesis. Most notably, COL10A1, COL11A1, COL1A1 and COL3A1 were up regulated, whereas, COL6A3 and COL1A2 were down regulated (Table 2 and 3). COL10A1 is known as a direct transcriptional target of RUNX2 during chondrogenesis (Zheng et al., 2003). Type XI collagen is a trimer consisting of 3 different polypeptides (α1 [A1], α2 [A2] and α3 [A3]) and COL11A1 is essential for the normal formation of cartilage collagen fibrils (Li et al., 1995). Many of these proteins are regulated by the sequence-specific transcription factor SOX9 (Bell et al., 1997; Zhang et al., 2003). Further investigation of SOX9-dependent and SOX9-independent transcriptional regulation may provide a novel therapeutic target for cartilaginous diseases, including osteoarthritis. Among the extracellular matrix genes, matrix G1a protein (MGP) was down regulated. Mgp-deficient mice exhibited the inappropriate calcification of various cartilages, including the growth plate, which eventually led to a short stature, osteopenia and fractures (Luo et al., 1997). The IGF signaling system is one of the major regulators of endochondral ossification. The chondrogenic-promoting activity of IGF-I is thought to be primarily transduced through a phosphatidyl inositol 3 (PI3)-kinase signaling pathway (Oh and Chun, 2003). PI3-kinase may be directly or indirectly responsible for chondrogenesis through currently defined metabolic genes. In our data sets, mRNA encoding insulin-induced gene 1 (INSIG1) was markedly up regulated, along with transcripts for IGF binding protein (IGFBP) 3, whereas IGFBP2 displayed the opposite behavior (Table 2 and 3). Validation of microarray expression data: To validate the microarray data using independent methods, novel markers were selected for the analysis of gene expression using RT-PCR. We were particularly interested in Cerebellar Degeneration-Related protein 1 (CDR1), whose function is unknown and two metabolic enzyme genes, Fatty Acid Desaturase 2 (FAD2) and sterol-C4-methyl oxidase-like (SC4MOL). Gene expression patterns for CDR1, FAD2, SC4MOL, COL11A1 and the known cartilage marker SOX9 were selected; the expression patterns for these genes matched those obtained by microarray analyses (Fig. 3). The microarray expression patterns of these genes were therefore validated through alternative experimental means, suggesting that the microarray data correspond to the actual gene expression patterns. The present transcriptome analysis of TGF-β1, IGF-I and insulin-induced chondrogenesis provided several lines of new, unexpected findings. Further study will clarify how these concomitant changes in gene expression are brought about and are organized into the concerted cellular event of chondrogenic differentiation in hMSCs. This study was supported in part by a Research Grant for Specific Diseases and the Japan Foundation of Aging and Health from the Ministry of Public Health and Welfare and a Grant-in-Aid for scientific research from the Japanese Ministry of Education, Science, Sports and Culture (II). Akiyama, H., M.C. Chaboissier, J.F. Martin, A. Schedl and B. de Crombrugghe, 2002. The transcription factor Sox9 has essential roles in successive steps of the chondrocyte differentiation pathway and is required for expression of Sox5 and Sox6. Genes Dev., 16: 2813-2828. Barry, F., R.E. Boynton, B. Liu and J.M. Murphy, 2001. Chondrogenic differentiation of mesenchymal stem cells from bone marrow: Differentiation-dependent gene expression of matrix components. Exp. Cell Res., 268: 189-200. Bell, D.M., K.K. Leung, S.C. Wheatley, L.J. Ng and S. Zhou et al., 1997. SOX9 directly regulates the type-II collagen gene. Nat. Genet., 16: 174-178. Dailey, L., E. Laplantine, R. Priore and C. Basilico, 2003. A network of transcriptional and signaling events is activated by FGF to induce chondrocyte growth arrest and differentiation. J. Cell Biol., 161: 1053-1066. Day, T.F., X. Guo, L. Garrett-Beal and Y. Yang, 2005. Wnt/beta-catenin signaling in mesenchymal progenitors controls osteoblast and chondrocyte differentiation during vertebrate skeletogenesis. Dev. Cell, 8: 739-750. Dupont, J., J. Khan, B.H. Qu, P. Metzler, L. Helman and D. LeRoith, 2001. Insulin and IGF-1 induce different patterns of gene expression in mouse fibroblast NIH-3T3 cells: Identification by cDNA microarray analysis. Endocrinology, 142: 4969-4975. Heng, B.C., T. Cao and E.H. Lee, 2004. Directing stem cell differentiation into the chondrogenic lineage in vitro. Stem Cells, 22: 1152-1167. Koch, H., J.A. Jadlowiec and P.G. Campbell, 2005. Insulin-like growth factor-I induces early osteoblast gene expression in human mesenchymal stem cells. Stem Cells Dev., 14: 621-631. Komori, T., H. Yagi, S. Nomura, A. Yamaguchi and K. Sasaki et al., 1997. Targeted disruption of Cbfa1 results in a complete lack of bone formation owing to maturational arrest of osteoblasts. Cell, 89: 755-764. Kronenberg, H.M., 2003. Developmental regulation of the growth plate. Nature, 423: 332-336. 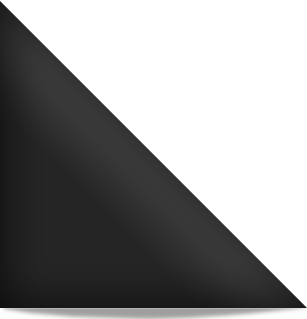 Li, Y., D.A. Lacerda, M.L. Warman, D.R. Beier and H. Yoshioka et al., 1995. A fibrillar collagen gene, CoL11A1, is essential for skeletal morphogenesis. Cell, 80: 423-430. Longobardi, L., L. O'Rear, S. Aakula, B. Johnstone and K. Shimer et al., 2006. Effect of IGF-I in the chondrogenesis of bone marrow mesenchymal stem cells in the presence or absence of TGF-beta signaling. J. Bone Miner. Res., 21: 626-636. Luo, G., P. Ducy, M.D. McKee, G.J. Pinero, E. Loyer, R.R. Behringer and G. Karsenty, 1997. Spontaneous calcification of arteries and cartilage in mice lacking matrix GLA protein. Nature, 386: 78-81. Mulligan, C., J. Rochford, G. Denyer, R. Stephens and G. Yeo et al., 2002. Microarray analysis of insulin and insulin-like growth factor-1 (IGF-1) receptor signaling reveals the selective up-regulation of the mitogen heparin-binding EGF-like growth factor by IGF-1. J. Biol. Chem., 277: 42480-42487. Oh, C.D. and J.S. Chun, 2003. Signaling mechanisms leading to the regulation of differentiation and apoptosis of articular chondrocytes by insulin-like growth factor-1. J. Biol. Chem., 278: 36563-36571. Otto, F., A.P. Thornell, T. Crompton, A. Denzel and K.C. Gilmour et al., 1997. Cbfa1, a candidate gene for cleidocranial dysplasia syndrome, is essential for osteoblast differentiation and bone development. Cell, 89: 765-771. Sekiya, I., B.L. Larson, J.T. Vuoristo, R.L. Reger and D.J. Prockop, 2005. Comparison of effect of BMP-2, -4 and -6 on in vitro cartilage formation of human adult stem cells from bone marrow stroma. Cell Tissue Res., 320: 269-276. Shukunami, C., C. Shigeno, T. Atsumi, K. Ishizeki, F. Suzuki and Y. Hiraki, 1996. Chondrogenic differentiation of clonal mouse embryonic cell line ATDC5 in vitro: Differentiation-dependent gene expression of parathyroid hormone (PTH)/PTH-related peptide receptor. J. Cell Biol., 133: 457-468. Shum, L. and G. Nuckolls, 2002. The life cycle of chondrocytes in the developing skeleton. Arthritis Res., 4: 94-106. Solchaga, L.A., K. Penick, J.D. Porter, V.M. Goldberg, A.I. Caplan and J.F. Welter, 2005. FGF-2 enhances the mitotic and chondrogenic potentials of human adult bone marrow-derived mesenchymal stem cells. J. Cell. Physiol., 203: 398-409. Tuckermann, J.P., K. Pittois, N.C. Partridge, J. Merregaert and P. Angel, 2000. Collagenase-3 (MMP-13) and integral membrane protein 2a (Itm2a) are marker genes of chondrogenic/osteoblastic cells in bone formation: Sequential temporal and spatial expression of Itm2a, alkaline phosphatase, MMP-13 and osteocalcin in the mouse. J. Bone Miner. Res., 15: 1257-1265. Zhang, P., S.A. Jimenez and D.G. Stokes, 2003. Regulation of human COL9A1 gene expression. J. Biol. Chem., 278: 117-123. Zheng, Q., G. Zhou, Y. Chen, X. Garcia-Rojas and B. Lee, 2003. Type X collagen gene regulation by Runx2 contributes directly to its hypertrophic chondrocyte-specific expression in vivo. J. Cell Biol., 162: 833-842.